Eleven volunteers serve on the MPPP Board of Directors to plan, implement and oversee all of the MPPP activities as well as manage the Wells Petroglyph Preserve. wife, Sue, to the Wells Petroglyph Preserve for its annual Flute Player Tour in October of 2014. They returned for the tour again in 2015, and in December of that year, sold their house in California and moved to Santa Fe. Alec’s professional background is as a software developer, starting as a computer games programmer with a well-known game company in the early 80s. A veteran of numerous Silicon Valley startups, he has worked in such diverse industries as logistics, biotech, healthcare, and accounting. He earned a B.A. in linguistics from UC San Diego, and his MBA from Duke University. Alec has been an avid sailor, backpacker and snowboarder, and loves his new proximity to the Santa Fe Ski Bowl. Katherine, long-time Board member and previous President, serves as Vice President of the MPPP Board of Directors. The Founder of the Mesa Prieta Petroglyph Project in 1999, she has worked tirelessly over the years to develop the recording program, the educational programs for local children and adults, and to preserve the culture and images of the mesa. In 2005 Wells was granted the Preservation and Conservation Award by the American Rock Art Research Association. In 2007 she gave the 156 acres of land that has become known as the Wells Petroglyph Preserve to The Archaeological Conservancy. Her memoir, Life on the Rocks: One Woman’s Adventures in Petroglyph Preservation, was published by the University of New Mexico Press in 2009. Katherine is a mixed-media artist and has provided the Project with extensive graphic design models over the years based on images found on the mesa. Norman is a scientist in the Bioscience Division of Los Alamos National Laboratory and has lived in the Española Valley for the past 26 years. His work at LANL has included research for the Human Genome Project, diagnostic assay development for the CDC and DHS, and environmental microbiology projects. mission of MPPP. He joined the MPPP Board in 2015 as a Member at Large and accepted position of Secretary in 2016. He has served as co-President of the Española Valley Opera Guild from 2000-2014 and has been a volunteer for the Española Valley Humane Society for many years. First learning about the Mesa Prieta Petroglyph Project from Katherine's memoir, Life on the Rocks: One Woman’s Adventures in Petroglyph Preservation, Sue could hardly wait to visit. And after viewing the petroglyphs, she became totally impressed both with the site and the individuals who work so diligently to protect it. From California, however, it was only possible to visit occasionally and support the Project from afar. She was happy, after moving to New Mexico, to become more involved and was elected to the board as treasurer in 2016. Sue's most recent position was on the executive staff of a non-profit in the San Francisco Bay Area serving as its CFO. Prior to that she worked with healthcare and technology related start-up businesses serving in financial, strategic, and management roles. A fifth generation Oklahoman, Sue graduated from Oklahoma State University and received an MBA from Duke University. She loved the Southwest her entire life and finds Mesa Prieta to be a very special place. Porter is from Santa Clara Pueblo, where he grew up participating in traditional life at his village and developed an interest in cultural preservation. He is an Assistant Professor of Indigenous Liberal Studies at the Institute of American Indian Arts in Santa Fe. Porter holds a Master of Arts in Interdisciplinary Studies with Concentrations in History and Political Science from Western New Mexico University in Silver City and a BA in Integrated Studies with an Emphasis in Pueblo Indian Studies from Northern New Mexico University in Espanola. Porter is a member of Santa Clara Pueblo where he lives along with his wife and their three children. Porter joined the Board of Directors in 2012; his strong inter-Pueblo relations and his cultural knowledge are very valuable to the Project. Matthew joined the MPPP Board of Directors in 2014 as a Member At Large. He serves as the Director of the Northern Pueblos Institute and Assistant Professor of Pueblo Indian Studies at Northern New Mexico College. A life-long member of Ohkay Owingeh, Matthew received his Ph.D. in 2008 from the University of Minnesota in American Studies and American Indian Studies and a M.A. in 2000 from Arizona State University in Political Science. His areas of expertise are in American Indian Studies and Public Policy, Tourism and Economic Development, and Pueblo Indian Studies. Gretchen joined the MPPP Board as a Member At Large in 2015 with a special appreciation of the animal petroglyphs on the Wells Petroglyph Preserve. She is a small animal veterinarian who has practiced in the Espanola Valley since 2000 after a career as an electrical engineer in Florida. Currently she works at the Espanola Valley Humane Society, does relief work for local clinics and owns "Angel Paws", a pet home euthanasia service. Gretchen's background also includes work with other local nonprofit organizations. She is a volunteer for the Rio Arriba Adult Literacy Program, San Martin de Porres Soup Kitchen and has served as co-president of the Board of the Espanola Valley Opera Guild for the past six years. Her passion is to help make our community better for four-legged, two-legged, and now two dimensional residents. Gretchen recently became Project Volunteer Coordinator. Her acceptance of this important position raised a huge cheer from the MPPP staff – a lot of the work in our organization falls to our intrepid volunteers, and we hope by having a dedicated coordinator our volunteers will feel useful and truly appreciated. Jan first visited MPPP on a public tour in October 2009 and was immediately entranced. She learned of a need for help with the databases used in the MPPP office and signed on, subsequently helping organize the library, both physically and digitally, logging in visitors, and tracking volunteer hours. She trained as a docent and for the last year has handled the merchandise table at the end of tours. She and her husband Russell moved to Taos in 2007 from Bethesda, Maryland, where they were both biomedical researchers at the National Institutes of Health. They enjoy road trips throughout the west, with an emphasis on geology and wildflowers, in addition to travels abroad. For seven years Jan served on the board of Los Jardineros, the garden club of Taos, performing various functions such as program organizer, corresponding secretary, and website manager. She is currently the president of the Taos Chapter/Native Plant Society of New Mexico and also serves as the chapter representative to the state board of NPSNM. John became an MPPP Board Member in 2017, following a 30-year career at Meredith College (Raleigh, NC), where he was Director of Media Services and taught courses in three departments. He team-taught, with his wife Susan McClintock, an Honors course, “American Indian History and Cultures.” He was also Co-director of the Art Department's "Summer in the Southwest" programs. He has been involved with the preservation of the Serpent Mound in Ohio and with excavation at the Fort Christanna site in Virginia. He was Historical Consultant and liaison with Indian tribes in the successful effort to develop the Fort Christanna Historical Site. He has recently written a revisionist history of the English Fort (1714), emphasizing Native involvement in all of its aspects. John’s first visit to the MPPP Preserve was in 2001 with college students. Little did he know then that he and his wife would one day be living on Mesa Prieta. John plays indigenous North American flutes and has recorded two CDs on those instruments. As an artist, he creates renderings for museums, public history projects, and tribal history initiatives. Researching and photographing features on the Mesa are among his latest obsessions. Joaquin Gallegos is an Assistant Professor of Environmental Science and the Chair of Biology, Chemistry, and Environmental Science at Northern New Mexico College. He obtained his masters degree in Range Science for New Mexico State University in 2007 and has since work in government and private industry. Mr. Gallegos' experience includes work in education, youth development, cattle industry, forest restoration, and habitat restoration. Currently some of his professional activities include assisting in organizing annual garlic festival, program coordinator for a youth internship program, teaching natural resource management courses, and directing student research in the areas of agriculture and forestry. For the past several years, Joaquin volunteered with the MPPP Summer Youth Intern Program. He created a new curriculum for teaching GIS and GPS to the interns, an essential aspect to learning to survey and record petroglyphs on Mesa Prieta. We are very pleased Joaquin agreed to be on the MP Board of Directors. Pat has lived in NM since 2003, having relocated from New York City. She has been a volunteer for many organizations: Rancho de Las Golondrinas, Wheelwright Museum, Interfaith Shelter for the Homeless, various musical groups and of course, Mesa Prieta Petroglyph Project! Pat has been a volunteer for MPPP since 2008! 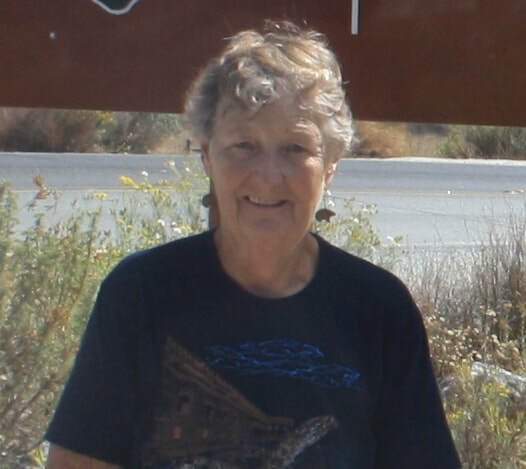 Pat began her MPPP career as a recorder, helped with the Summer Youth Intern Program for many years, and eventually became a docent, leading tours of the Wells Petroglyph Preserve (where she is also a Sitewatch Steward!). If that is not enough - she also helps with various administrative tasks in the office. Pat was raised on a farm; she graduated from Ohio State University and Wright State University. She has had several different careers: dental hygienist, politician, teacher, and several different management jobs, primarily in the political world.